Jamaican singer/songwriter/producer Cezar has just released his latest recording “She Said”. This mid tempo ballad reveals a mature side to Cezar’s artistry, and different aspects of this are showcased by the four different mixes included. The reggae vibes mix was produced by Andrew ‘Preggs’ Thompson and Elton Brown for State of the Art Music. The club mix was produced by Conroy Forte and Ryan Chin for Washroom Entertainment, while the acoustic mix was produced by Rohan Dwyer. A house version was also produced by DJ Josh from Bulgaria. According to Cezar, “‘She Said’ really came out of the track itself. I received the track from a friend and producer and after listening to it for a short while, the idea for a melody popped into my head using a repetitive ‘she said’ line. After that I drew on conversations I had with friends or overheard about the things that women say and feel about relationships”. Cezar added “I decided to make the song be a story of a conversation I was having with a woman who had been hurt from a relationship that she was involved in. The rest just fell into place. Sometimes songs write themselves and this one did that in many ways”. Cezar has worked with a list of who’s who from the reggae music fraternity including producers Tony Kelly, Steven ‘Lenky’ Marsden, Louis ‘Flabba’ Malcolm, David Kennedy, and Mario ‘Mario C’ Campbell. He has also written songs for Tami Chynn, Wayne Marshall, Maya Azucena and soca artist Machel Montano among others. Cezar’s strong writing ability gained him second place in World Music in the 2006/07 International Songwriting Competition for “Keep On”. 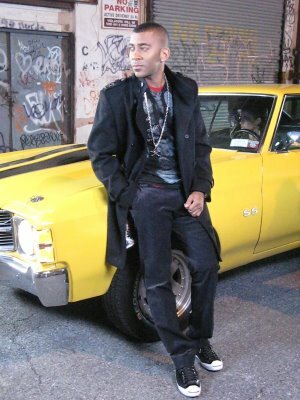 The remix earned Cezar the honor of being the first Jamaican ever to have his song endorsed and licensed by Coca Cola, who used it as part of its Beijing Olympics campaign, complete with a limited edition Coke bottle bearing Cezar’s name. She Said will be featured on Cezar’s forthcoming album Musaic. Cezar is currently managed by Rodney Hill of RHH Music Corp.